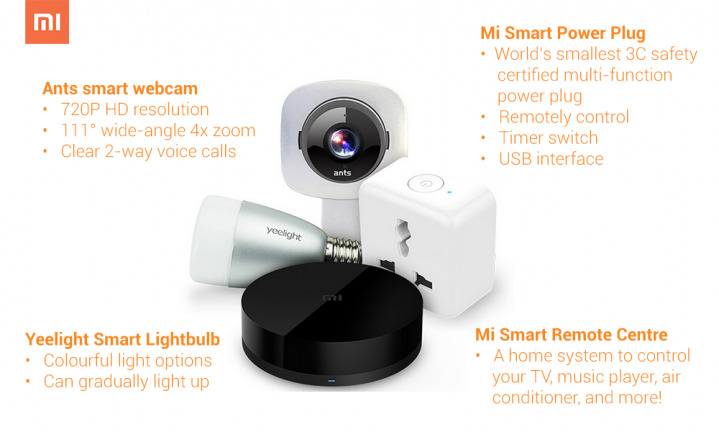 Smart home devices are a hot trend, and Xiaomi seems to be keeping close tabs on the ones that do well. It launched 4 smart home gadgets to its phone users. This development from Xiaomi comes as arch-rivals ways to integrate smart home gadgets with your phone or tablet. The “Ants Smart Webcam” as it’s been dubbed, sports 720p resolution, a 111 degree wide-angle lens with 4x zoom, and the ability to make two-way voice calls. Activated and viewable via the smartphone, it doubles as both a webcam for chatting and a security camera with recording capabilities. The camera automatically records whenever it detects movement in view. This Smart Cam is priced at $25. Mi Smart Power Plug is the tiniest multifunctional power plug approved by 3C safety verification. Remote control and timer switch, with USB interface. It is priced at $13. Yeelight Smart Lightbulb has many Colorful light options for you to choose from. This product is under Beta Testing for now.